Italy is one of my favorite countries and Venice in particular, is fabulously gorgeous. The old buildings and canals, bridges and squares, and gondolas make for spectacular photographic images. You'll feel inspired around any corner. Unfortunately I haven't been back since my initial visit some twenty years ago. However, with this exquisite book, I can revisit the sights anytime I wish, and conjure up memories I made so long ago. Photographer Livio Bourbon's magnificent photographs capture the essence of this ancient and historic city, while Matteo Varia's words explain the area's growth from around 3,000 years ago. The famous lagoon and it's origins are also explained. Not only are the Venetian photographs breathtaking, but there are also beautiful paintings featured. Statues, friezes, and arches and columns are evident all over the city, drawing us in to take notice of the architecture. Colorful walls reflect shades of light and dark so necessary when wanting great pictures. 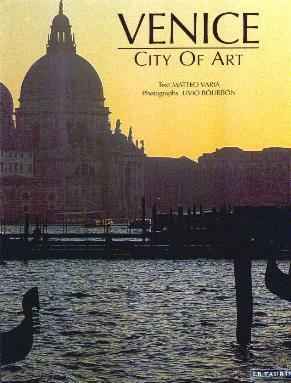 If you want to know a little Venetian history, or about the shipyards, or about those who invaded these islands, you'll get this and more from this book. For absolutely incredible beauty, take a long look at the picture of St. Mark's Basilica on pages 78/79. Venice is also known for its glassblowing craft and the colorful carnival masks. Conclusion - A spectacular adornment for your coffee table.